High-school secret agent Sousuke Sagara is assigned to protect honor roll student Kaname Chidori from a large band of international terrorists! What could they want from her? This translated manga, based on the popular anime series of the same name, is a stunningly fresh blend of humor, romance, action, impressive artwork, whacky characters, and quite a few original ideas. 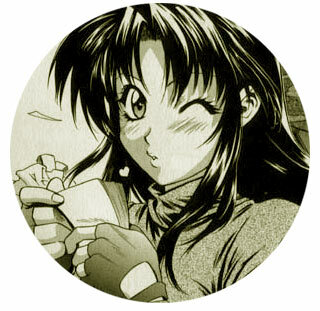 Shouji Gatou does a spectacular job at designing some of the most well-drawn characters ever seen in manga. Combined with such an awesome plot, this manga is a must-have. Considering this is one of ADV's first forays into the world of manga publishing in the states, we are impressed. Can't wait for more! 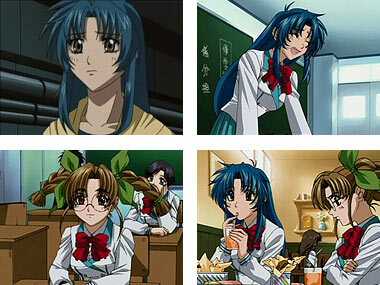 Below: Scenes from the Full Metal Panic TV series.